Donald McKay (1810-1880) was a master shipbuilder, with his shipyard located on Border Street in East Boston. His company launched many of the fastest clippers in history, with Flying Cloud being the most famous. A clipper ship is a large sailing vessel with three or four masts and square-like sails. The bow or front of the boat is wide and raked forward, allowing increased speed on the open ocean. The clippers were utilized for the New York-San Francisco run during the California Gold Rush, as well as trans-Atlantic routes. The clipper ships of the 1850s are an inspiration for today's Coast Guard cutters, which are designed for speed in rough seas. 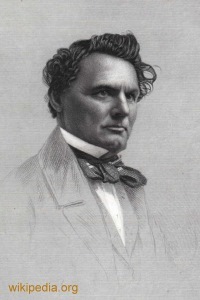 Donald McKay, shipbuilder, was born in Shelburne, Nova Scotia, September 4, 1810. 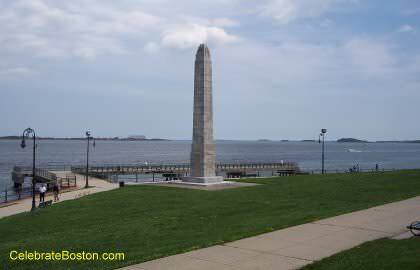 He learned the shipbuilders' trade in New York City, settled in Newburyport Massachusetts, as a shipbuilder, and in 1845 removed his business to East Boston, where he conducted a large shipyard. He built for Enoch Train several clipper ships for his line of Liverpool packets (Diamond Line) which were celebrated for their speed. He also built many of the New England clipper ships for the California and Australian trade. He built the Great Republic, of 4556 tons, in 1853, at the time the largest merchantman in the world; the Flying Cloud, that made the run from New York to San Francisco in eighty-nine days, three days less than the Great Republic; the Sovereign of the Seas, 2400 tons, making 430 geographical miles in twenty-four consecutive hours and 3144 miles in ten consecutive days. He constructed the model of a paddle-wheel steamer, exhibited in July, 1853, which he claimed would cross the ocean in six days. He constructed a number of U.S. Gunboats, including the light-draft monitor Nauset and the double-end gunboat Ashuelot, [Native American word meaning "A collection of many waters."] for service in the Civil War. The last boat of his construction was the U.S. Sloop-of-War Adams, in 1874. He retired to Hamilton, Massachusetts, in 1874, and devoted himself to farming. The beauty and speed of the clipper ships, Westward Ho, Flying Fish, Bald Eagle, Empress of the Seas, Staghound, Star of Empire and Golden Fleece gave him a world-wide reputation as a naval constructor. He died in Hamilton, Massachusetts, September 20, 1880.